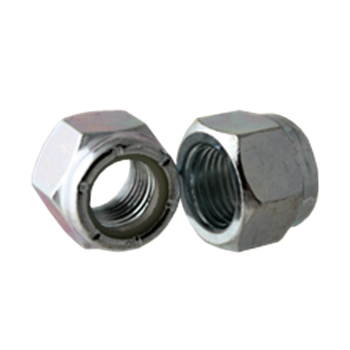 Nylon Insert Locknuts are basically a hex nut with a nylon-filled collar at its back end. When a screw reaches the collar, the threads and nylon form a tight, frictional fit, restricting movement of the screw when it's subject to vibration. The nylon insert comes in various colors depending on the manufacturer. Nylon Insert Locknuts are able to be reused more times than a two-way reversible nut. Steel nylon insert locknuts are less expensive than grade C automation locknuts however, the nylon with begin to deteriorate at temperatures from 150-300 deg F.